Develop the skills needed to find yourself in a cutting edge career. Students in the Computer Science program prepare for a future in software development to solve the complex problems faced by 21st Century America. Computer Science continues to be one of the most in-demand fields of study across the United States and around the world. EOU offers one of the only fully online undergraduate computer science degrees, starting in fall 2020. This survey course introduces computer software, the process of its development, and its uses in contemporary society. Topics include data representation, basic computer architecture, and categories of software including multimedia products, end-user applications, process-control, and scientific computing. Emphasis is placed on the technical details of the microcomputer system as a whole in order to produce sophisticated users. This course focuses on microcomputer operating systems, their structures and relations to the microcomputer architecture, a technical understanding of information flow through the microcomputer and its hardware interfaces. This course also introduces the Internet, networking, and communications protocols such as TCP/IP. Introduces basic data representation, branching and iteration, memory management, computer architecture, and the analysis and design of problem solutions. Introduces some common algorithms for searching and sorting, the analysis of algorithm complexity, exception handling, and file output. Prerequisites: Math 111, CS 161. CS 210 – Selected Topics (Credits: 1 to 6)An in-depth presentation of a topic of interest to both students and faculty. Topics will vary from year to year depending on the interests and availability of faculty. Prerequisites: May be required for some topics. An introduction to the basics of programming as used in C and C++, including selection statements, loops, arrays, string handling, pointers, registers and functions. Practical exercises will require the construction, compilation, debugging, and execution of complete programs that implement given algorithms to solve simple problems. The emphasis in this course will be on the common features of C and C++; however memory allocation and the use of pointers will be discussed in the context of the ANSII C implementation. Prerequisite: CS 162. The essentials of UNIX tool programming will be covered with the use of high-level programming languages, utilities, and toolkits. Topics include UNIX shells and essential utilities and network security issues, and high-level networking and protocol basics. Provides students with an opportunity to team the tools and programming languages that will help them make the best use of UNIX. Prerequisite: CS 221. An introduction to various implementations of commonly used data structures and their applications. Topics include lists, stacks, queues, trees and hash tables. Prerequisite: CS 162. An in-depth presentation of a topic of interest to both students and faculty. Topics will vary from year to year depending on the interests and availability of faculty. Prerequisites: May be required for some topics. Students must have at least a Sophomore standing to register for this course. The principles and problems involved in the development of a computer operating system. Overview of the development of operating systems, sequential and con-current processes, cooperation, communication and mutual exclusion, synchronization constructs: monitors, conditional critical regions, semaphores; deadlocks, resource allocation, scheduling policies, storage management. Prerequisite: CS 248. Student must have at least Sophomore standing to register for this course. Covers models of software development, with emphasis on the prototyping model, and user interface design. Students will design an interactive product, producing deliverables for each stage of design up to the development of a working prototype. Prerequisites: CS 162: Foundations of Computer Science II. Students learn to apply procedural and object oriented programming methodologies to create interactive products for informational, educational, and entertainment applications for web or stand-alone delivery Prerequisites: CS 162: Foundations of Computer Science II. The analysis of variety of algorithms that arise frequently in computer applications. Basic principles and techniques for analyzing and improving algorithms in areas such as List Searches, Sorting, Pattern Recognition, Polynomial and Matrix Computations. Prerequisite: MATH 231 and CS 260. Student must have at least Sophomore standing to register for this course. Includes automata, complexity, Turing machines, unsolvable problems. Prerequisite: CS 318. Student must have at least Sophomore standing to register for this course. Covers the three dimensional computer modeling tools for the creation of still and moving images. Topics include creation of models using a variety of techniques including spline and vertex editing; animation using keyframes, skeleton rigging and morph targets; virtual lighting, and use texture maps. Prerequisites: CS 162: Foundations of Computer Science II. Analysis, design, and implementation of data systems in relation to information transfer. Prerequisite: CS 260, CS 3184. Student must have at least Junior standing to register for this course. An introductory examination of the Open System Interconnection Reference Model (OSI). Topics covered include network architecture, data flow control, transmission control, path control, recovery, and routing techniques. Prerequisite: CS 311. Student must have at least Sophomore standing to register for this course. Introduction to fundamental concepts of object-oriented software development. Covers requirements determination and specification and systems design using the Unified Modeling Language (UML). Emphasis is placed on methods of iterative and incremental software development. Prerequisite: CS 260. Student must have at least Sophomore standing to register for this course. A study of object oriented programming with C++. Beginning and intermediate concepts are covered including classes, objects, member functions, overloading, inheritance, polymorphism, templates, and virtual functions. Prerequisite: CS 221, CS 260. Student must have at least Sophomore standing to register for this course. Development of applications for phones, tablets, and other mobile devices, with an emphasis on the constraints facing mobile application design and development from both a hardware and user perspective. Introduction to current mobile app frameworks, events, and user interfaces. Prerequisites: CS 360. Introduces principles of human-computer interface design and methodologies of implementation, evaluation, and research in human-computer interaction. Topics include user psychology, dialog styles, error handling and reporting, system response time, user documentation and help systems, and “intelligent” interfaces. Discusses techniques for the implementation and testing of human-computer interfaces. Prerequisite: MM 252 and MM 315 (concurrently). Student must have at least Sophomore standing to register for this course. Emphasis is on the specification, organization, implementation, testing, and documentation of software. Inherent problems, challenges, tools, and methods of a large software project. Presents methods and tools used in the various stages of software production. This course should prepare students for the problems they will encounter as software professionals. Prerequisite: CS 344. Student must have at least Sophomore standing to register for this course. Concepts of high-level programming languages. Syntax and semantics of several existing languages. Compilers, interpreters and formal syntax specification. Prerequisite: CS 360. Student must have at least Sophomore standing to register for this course. Prerequisite: Upper-division standing or Consent of instructor. Student must have at least Junior standing to register for this course. Students gain practical experience in a professional or pre-professional setting. Prerequisites: Upper-division standing and consent of instructor. Student must have at least Junior standing to register for this course. An in-depth presentation of a topic of interest to both students and faculty. Topics will vary from year to year depending on the interests and availability of faculty. Prerequisites: May be required for some topics. Student must have at least Junior standing to register for this course. This course studies the principles underlying the generation and display of 3D computer graphics.Topics include geometric transformations, 3D viewing and projection, lighting and shading, color, camera models and interaction, and standard graphics APIs. Prerequisites: CS 221 and junior standing. Introduction to numerical methods. Includes topics from elementary discussion of errors, polynomials, interpolation, quadrature, linear systems of equations, and solution of nonlinear equations. Prerequisite: MATH 261, CS 360. Student must have at least Junior standing to register for this course. This course will cover some of the emerging technologies in the area of dynamic Web page development and Web server programming, including DHTML, XML, and Java Server Pages. Prerequisite: CS 330. Student must have at least Junior standing to register for this course. EOU houses multiple computer lab options across campus with 24-hour access. These labs are used in the classroom setting but are also available to students to work at an independent clip on projects relating to Computer Science, Multimedia, Art and more. 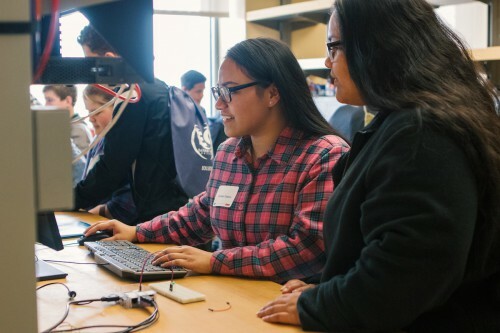 EOU strives to maintain access to cutting edge hardware and software to empower our students with the tools they need to be successful. Associate Professor, came to EOU in 2000. He is the program chair and specializes in educational programming, computing theory, and 3D graphics applications. Senior Instructor II, came to EOU in 2018. Tim was a computer scientist for 30 years and a grades 6-12 computer science teacher for 6 years before coming to EOU. Tim designed and developed tools (software, methods, and training) to improve software development practices for the defense industry for 15 years. Then, he taught/consulted object-oriented technology for 15 years. Tim’s specialties are object-oriented analysis, design & programming, requirements analysis, programming languages, and computer science education. Steve was a software engineer for 24 years before coming to EOU, building software for the telecommunications industry. Steve’s specialties are object-oriented programming, software engineering, and database management systems. Instructor, teaches our networking classes. Tim is also the networking and IT specialist for La Grande schools. 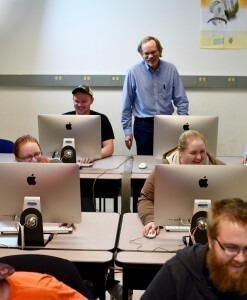 EOU's degree in Computer Science will set the stage for a career in Computer Programming, Software Development, Systems Analysis and many more. These are all highly in demand in both public and private sector. EOU graduates are currently working for Google, Apple, HP or seeking further expertise in graduate programs. Courses include Foundations of Computer Science I & II, Data Structures, Operating Systems, Computer Architecture, Artificial Intelligence, Mobile App Development, 3D Graphics and Animation and more. Capstone projects help culminate student learning into a functional and professional piece of work. One capstone that would get folks' attention is the game "Stampede!" which Anthony Hilyard developed as his capstone a couple of years back. It is available for Droid phones from the Google App store here. Students in computer science will learn to design and develop software systems for industrial, scientific, commercial and educational applications. They will acquire an understanding of programming, analysis, data structures, algorithms and operating systems. Graduates will be prepared to work in the private or public sector, or to proceed to advanced study.